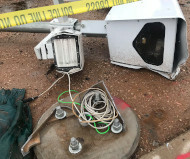 The automated ticketing machine located at the intersection of North Tatum Boulevard and East Thunderbird Road in Phoenix, Arizona, toppled on Saturday. Local officials surrounded the badly dented intersection camera with yellow tape marked "Police Line -- Do Not Cross." A vigilante in Belyayevskaya, Russia, grabbed a mobile speed camera from the side of a freeway on Wednesday. According to Orenday, a thirty-six year old man has been charged with taking the device. In Ariano nel Polesine, Italy, vigilantes on Tuesday used burning tires to destroy the speed camera on the SS309, Il Resto del Carlino reported.